I love trains; it is one of my favourite transportation methods. What makes it even better is when I travel in First class and I enjoy the great service for the same price as coach. I recently travelled to London for training and to Bulgaria to visit family. I managed to get amazing deals throughout my trip and I totally enjoyed it. 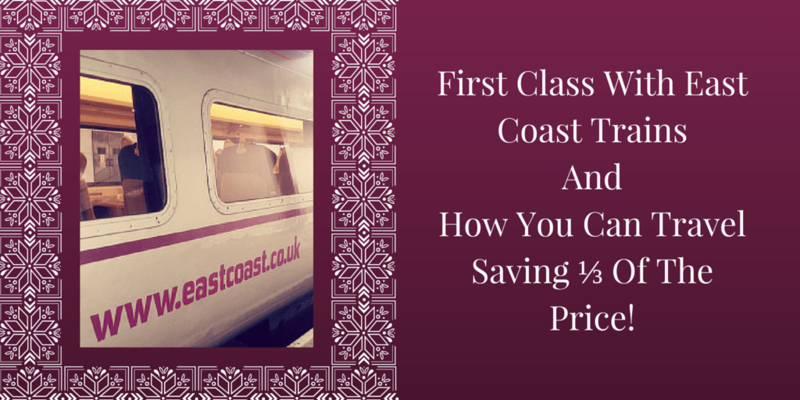 I booked my First Class ticket with East coast for the same price as coach, which was about £35 one way. This was pretty good considering this train service can cost up to £300 one way. 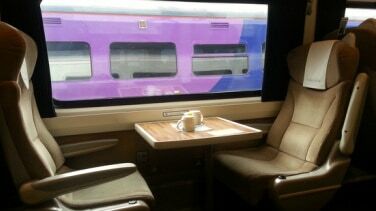 Here is my review of the First Class East Coast train to London from Leeds. The train was on time and on the first platform so very easy to access. I was there on time and was one of the first persons on the train. I went early on purpose so I can take some photos for you. First Class is much more spacious than coach, has less seats, bigger and more comfortable chairs as well as free internet, table for each seat and complimentary catering service. 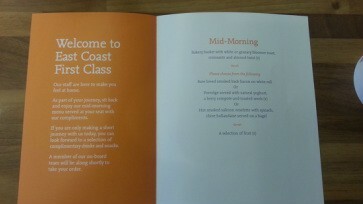 On your seat you can find the menu, they have breakfast, lunch and dinner menu depending on the time of day you travel. This was morning service and the breakfast selection was surprisingly good for a train. 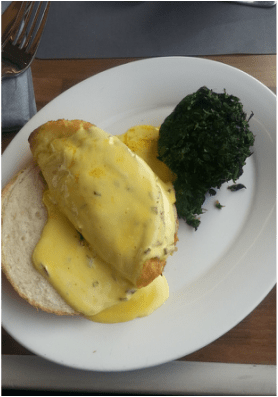 I chose the hot option which was eggs benedict with salmon and spinach, perfect for the morning. They come around quite often to ask you if you want coffee, tea and juices as well as offering you water and snacks such as croissants and cookies. The train was quite full by the time we reached Doncaster and it got noisy because of a few couples drinking champagne at 11 in the morning!! Definitely not my cup of tea but they were celebrating something. The train ride is only 2.5 hours to London, the staff are welcoming and polite and do try their best to serve you. The only negative about this train ride was the internet, or more like the non-existent internet connection. It was painfully slow, after an hour I gave up and used my phone. By the time I reached London I was full, relaxed and happy. I can see why all business people use the First class, it makes your trip so much more enjoyable and you are ready to do business once in Leeds or London. Most definitely, I would encourage every Muslim or non muslim family to enjoy a weekend in London in First class. I know this can be a lot for a family but here is my thinking and what I did. The tickets can range from £60 return in First class to £500. I would not pay £500 for sure but up to £80 per person I would. The day I booked my ticket, coach and first had only £10 difference, considering the space, food, environment it is no brainer that £10 is worth it. What makes this even better are the cool offers that can make this accessible for every family. There is a new railcard for couples who travel together called “Two Together” this way you can save ⅓ of your trip. When I was looking for a train ride for Easter Holiday the price for 2 in First class was £140 return, with the card it was £98 return for two. Considering we would pay the same amount for petrol and parking it makes this a good deal. The card costs £30 for a year but you have already made a £10 saving just from this trip. This also works in coach so you can save even more. See details here. There is the family rail card, works the same way and you can save ⅓ of your travel in any class. See details here. Keep an eye on MuslimtravelGirl as RedSpottedHanky has offers where you can get £10 off coupons for just signing up to their mailing list. So far I managed to get £30 off our next train travel and on the next round of offers. I will post them here. Keep in mind you have to be extremely quick in order to get one!! So sign up to the mailing list and you will receive an email instantly with the details, in sha Allah.